So for the moment this Nutrisystem diet is occupying my mind. Maybe it’s the food depravation I feel with the diet. I mean I can’t say you completely starve, but if you’re used to eating till your stuffed and munching on snacks when you’re a bit fidgety then it really starts to wear on you and preoccupy your mind. (ah shoot! I should have signed up to be an affililate of linkshare so I could have made money on mentioning them here. Oh well). And let me say that the sign up process with linkshare.com seems to have a lot of technical problems. During the registration it kept on complaining that I didn’t type in their special code correctly. So it took me about 7 registration attempts spread out over about 40 minutes before I finally got thru. So I signed up with Nutrisystem and am now just waiting for Nutrisystem’s approval. But anyway back to the diet. For males Nutrisystem gives me 6 eating times a day. Those times are breakfast, morning snack, lunch, afternoon snack, dinner, and dessert. For all the meals except for dinner they stress fat free food items. But then for dinner they give you a larger food portion and grant you the luxury of one serving of Fat. Ahh fat, it makes things taste so good. And after a hard day holding off on munching on snacks and eating smallish portions, Nutrisystem allows me to be bad and splurge: the Nutrisystem way. And I look at the Nutrisystem guide as to what I can eat as my fat serving. I see there are some almonds and think great, I got a whole can of roasted almonds. And as my fat serving Nutrisystem allows me FOUR measily almonds! Woo hoo. Oh Boy! Oh Boy! 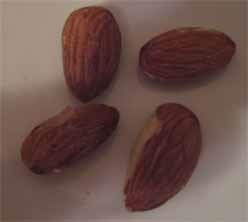 Four stinking almonds. So anyway I sort of pass on the offer for 4 almonds. I figure if I’m going to use my Fat allowance for the day I’d rather skip the 4 almonds and get my fat maybe spread out in greater quantities of something else. Maybe when I sneak a few low fat nacho chips (ssshhhhh!). Nutrisystem doesn’t have anything like real nacho chips. But anyway they do mention I should get low glycemic carbohydrates such as brown rice. I don’t really understand the “low glycemic part” so I figure nacho’s equals carbs and being low fat means a few of these is the same as having those 4 almonds and something like brown rice. Right? I know in not quite following the plan exactly. But it’s close enough. I mean I am actually losing weight. Today I’m at 185 pounds.